According to various recent research and survey results, in the UK alone approximately 1 in 3 people struggle with insomnia or other sleep issues. At first glance, you might think that poor sleep is an issue for the employee to address at home. But the knock-on effect of sleep deprivation carries over into the workplace every single day, reducing productivity and decreasing employee engagement. Mental health and the quality of a person’s sleep are very closely linked. Lack of quality sleep is also linked to a wide range of cognitive and physiological impairments. From increased stress levels, mental health issues, decreased working memory capacity, and inability to focus on tasks, to increased risk of heart disease and elevated blood pressure – the list is ever-growing. To find out more about how we can help your organisation, request a copy of our information pack. Sleep issues and the related tiredness during the day eventually leads to individuals failing to function well during the working day, and in their free time. It is a quite simple chain of events that happens for so many employees in today’s busy and demanding society. The term ‘burnout’ is heard more and more around the corridors of companies everywhere. The root of this problem stems in tiredness and manifests as a loss of motivation, resilience, and sometimes the onset of depression. Burnout is avoidable with the right wellness strategy in place. However, when loyal and hardworking employees get the support they need to balance their work with their health, they avoid more serious health concerns being triggered. In turn, the organization experiences better talent retention rates, increased work performance, reduced absenteeism and better teamwork. These are results I have seen repeatedly from working on wellness strategies with organizations and individuals over the years. From CEOs and senior management to support staff; people from all walks of life benefit from healthier sleep at night. Genuinely restorative sleep helps them with their emotional stability, intellectual capacity, occupational drive as well as their physical health. See below report from RAND Europe on "Why sleep matters - the economic costs of insufficient sleep"
We recommend you contact us before booking any of the services below. This will help your organisation to find the best and most suitable way to make measurable impact and support your employees. A well planned and executed wellbeing strategy or sleep workshop is vital to retain a healthy, motivated and driven workforce that is loyal, engaged and supportive. Which is why it is very important to tailor make these services depending on the needs of your organisation and employees. We are very happy to help and support you to ensure that our services fit the organisation's needs and deliver a measurable outcome, which is the most important part of any wellbeing strategy. I am very proud to present a Keynote Speech to HR Professionals at the first ever Somnex - The Sleep Show in London on 12th October 2018. 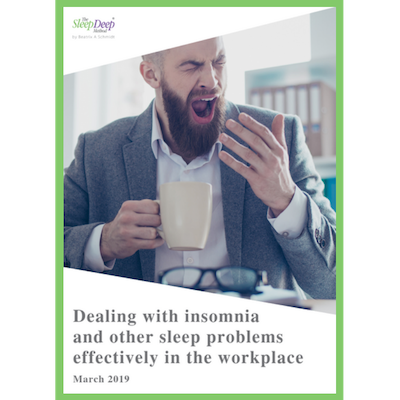 Amongst other things, I shared my views on what I believe makes an effective wellbeing strategy to address insomnia and sleep deprivation related problems at work. This video is a collection of the the highlights from the entire keynote speech to help you identify what you and your organisation is able to do to support your employees who might be struggling with sleep issues. I recently worked with Beatrix on a project that had a short lead time for planning, but very high expectations for delivery. It was the first time we had worked together and Beatrix did everything she could to make the process smooth and successful. The workshop she delivered was educational, relatable and fun. I would definitely recommend her and look forward to working together in the future. During the interview for the summit, she pointed out so many things that are often overlooked when it comes to improving sleep. We had over 2,000 people watch this interview and the feedback was 100% positive. She is very easy to talk to and she presents her topic in a practical and simple way which helped the attendees to start improving their sleep right away. She has a warm and genuine style that comes from real life experience that we can relate to. We wanted to give our HR Director attendees a taster of the workshops we offer as part of their wellbeing plan. The sleep workshop was a great insight into what can be offered in workplaces as part of their programmes. Beatrix has been presenting at the Barbican Library for a couple of years now. Her talks are popular because they answer a most pertinent question for many City workers: how can I maintain a virtuous circle between a fulfilling life and restorative rest. Beatrix brings her own experience to bear in explaining how it is possible to switch off and experience restful sleep which makes possible a full and active lifestyle and better work productivity.